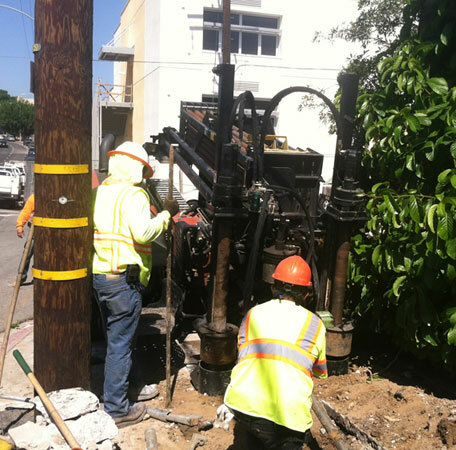 Los Angeles Signal Construction, Inc. is also equipped to offer you its Directional Boring service. This process is performed using heavy-duty directional boring machines, which often rely on hydraulics to generate sufficient drilling power. Prior to drilling, potholing is to be performed to locate and protect utilities by other agencies. The directional boring machine dril s a small pilot hole using a special metal bit. This pilot hole serves as a guide for the remaining bores. After the pilot hole has been drilled successfully, our workers drive a metal cutting tool, or reamer, through the soil. The reamer cuts out a path larger than the diameter of the planned piping or conduit. Finally, the reamer is run through the bore once more, and is used to drag the pipe or conduit into place. Rather than drill these holes straight down, directional boring allows our workers to create horizontal bores that run parallel to the ground above, which we use to lay underground utilities, including electric lines.